Today we will talk about the Scrum task board. Although widely used and considered a symbol of agile methodology, with its colorful post-its, this task board is not part of the Scrum framework. In the Scrum guide, we find no reference to its use. Kanban, the name given to this board, that means in Japanese record or visible plaque, is just one way that many teams use to manage the progress of tasks. But if it is not referenced by the Scrum guide, why so many teams use it? Why is it so famous? Simply because it fits like a glove to manage the progress of the work. The product backlog items that were selected in a sprint must be broken down into tasks so that the development team can turn it into an increment for the product. As the tasks board is not part of the Scrum framework, there is no recommendation specified in the guide. In this post I will try to explain basically what it is and how to organize it so that you can better understand the concepts and the dynamics involved. Each row from the task board is a backlog item (user story) and it should be included all necessary tasks to complete this sprint backlog item. Initially, tasks are inserted in the first column of the table, and as they are being developed, they advance until they came in last column. Thus, when looking at the picture, the person is able to easily see how is the progress of the work. For each task, a post it is attached to the frame. Different colors can be used for different activities, such as: A different color can be used for tasks that are bug fixes. This helps further inspection of the working process. 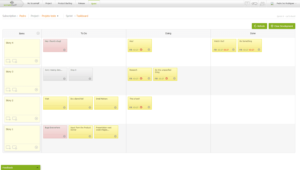 A task board that has many tasks involving rework may indicate problems in the tests the functionality, for example. The kanban board it is very useful on the framework Scrum because it ensures transparency and inspection, two of the pillars that support the framework. Transparency is ensured when all committed to the project can follow at any time, as is the development of each story, the problems encountered them. Inspection is possible in the interpretation of it: many post-its representing impediments may indicate problems, as well as a task that is being done for so long. The interpretation of the framework can lead to diagnosing complex problems very easily, visually and intuitively.